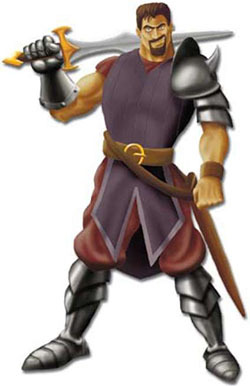 You will all win or lose together, but in the end only one player will be declared the Master Slayer! 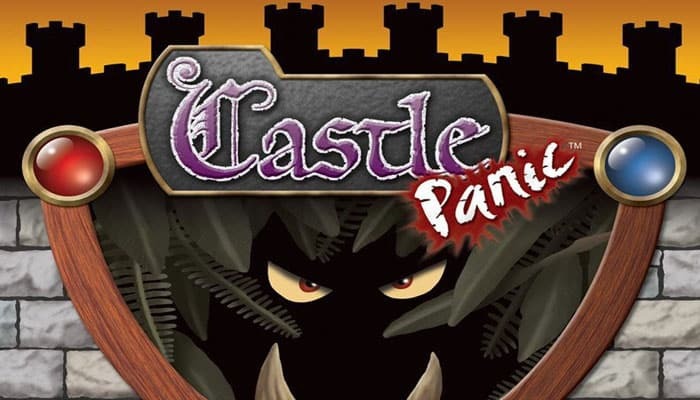 Castle Panic is a cooperative game with a twist. The players work together as a group rather than competing against each other. 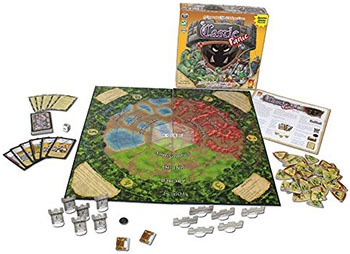 Players use cards to hit and slay Monsters as the Monsters advance from the Forest toward the Castle. Players trade cards and plan strategies together to stop the Monsters from smashing the Castle Towers. They either win or lose together, but only the player with the most victory points is declared the Master Slayer. To win, players must play through all 49 Monster tokens, slaying all the Monsters that are revealed. Players lose if the Monsters destroy all the Castle Towers. There are three different ways to play Castle Panic: Standard, Co-op, and Overlord. 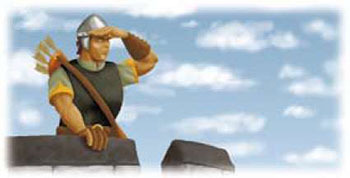 The Standard game is described in the rules that follow. For more information on Co-op and Overlord versions. 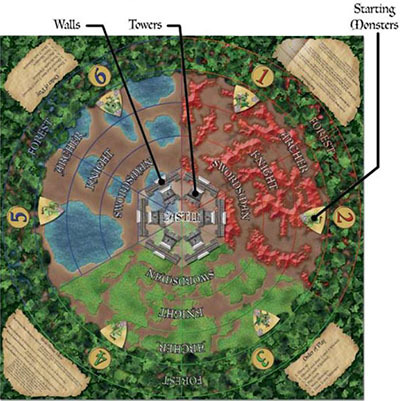 The board has a series of rings with the Castle at the center. The rings are labeled and split into red, green, and blue arcs that are numbered 1 through 6. The outermost ring is the Forest. This ring has the arc numbers on it. The numbers are where the Monsters will start on the board. The next ring is the Archer ring. The Knight ring is further inward. And the Swordsman ring is closest to the Castle. The center of the board is the Castle ring. This is where the Towers of the Castle are placed. The line between the Swordsman ring and the Castle ring is where the Walls of the Castle are placed and built. The order of play and summaries of some of the more challenging Monster tokens are printed at the corners of the board for easy reference during play. 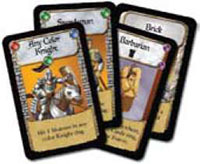 49 Castle cards: Players use cards to attack the Monsters and defend the Castle. 49 Monster tokens: These are the Monsters and Special Effects that the players must survive. 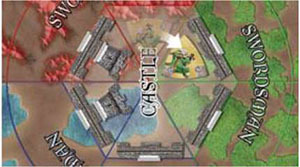 6 Walls with plastic stands: Walls keep Monsters out of the Castle and can be rebuilt if they are destroyed. 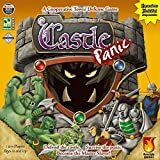 (The first time Castle Panic is played, the plastic stands will need to be put on the Walls and Towers). 6 Towers with plastic stands: Towers are the heart of the Castle. If the Monsters destroy all of the Towers, the players lose the game. 1 Tar token: This token is used when the Tar card is played. 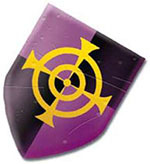 2 Fortify tokens: These tokens are used when the Fortify Wall card is played. 6 Order of Play cards: These cards aren't used in the game. They are just helpful reminders of what to do on a turn. 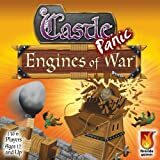 No matter which version of Castle Panic is played, the game is always set up the same way. Players choose which Monster goes into which arc, but there should only be 1 Monster in each arc. 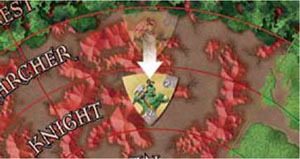 Place each Monster so that the corner with the highest number is pointing toward the Castle, as shown here. Put one Tower in each of the light- colored spaces in the Castle ring. Any Tower can go in any space. Put 1 Wall on each of the lines between the Castle ring and the Swordsman ring. Draw 3 Goblin, 2 Orc, and 1 Troll from the Monster tokens. Place one Monster in each arc of the ring labeled Archer. Note: During the rest of the game, Monsters will start in the Forest ring. Monsters are placed in the Archer ring during setup only, which allows the first player to hit or slay Monsters. Separate the 6 Order of Play cards from the Castle cards and give 1 to each player. Keep this card in view to remember the steps of each turn. Set any remaining Order of Play cards aside; they will not be used in the game. Shuffle the Castle cards and deal a hand face-up to each player. Since Castle Panic is cooperative, there is no need to keep cards secret. The number of cards in the hand depends on the number of players. Use the chart below to determine how many cards to deal to each player. Place the remainder of the Castle deck face down. This will be the draw pile. Leave room for a face-up discard pile next to the draw pile. Turn the remaining Monster tokens face down and mix them up. Set them aside-this will be the Monster pile. Leave room nearby for a Monster discard pile. Place the Tar and Fortify tokens nearby for use when the Tar and Fortify cards are played. Draw back up to a full hand of cards. When the deck of Castle cards runs out, reshuffle the discards to make a new deck. Because each player has a full hand to start the game, players do not draw up on their first turn. At the start of a turn, the player may discard 1 (and only 1) card from his or her hand and draw a new card to replace it. Players never have to discard if they don't want to. On his or her turn, a player can trade cards with other players to improve his or her hand. The number of cards players can trade depends on the number of players in the game. For a 2- to 5-player game, a player can trade 1 of his or her cards with 1 card from any other player. Each player may make only one trade on his or her turn. For a 6-player game, each player can make 2 trades on his or her turn. Each player can trade 2 cards with the same player or trade 1 card with 2 different players. Both players choose which cards they want to trade, and players never have to trade if they don't want to. Players cant trade with a player that doesn't have any cards and can't simply give a card to another player. It has to be a trade. In this phase, the player can play as many of the cards in his or her hand as he or she is able. Cards can be used to attack Monsters, slay Monsters, slow them down, build Walls that were destroyed, or even draw more cards! To attack a Monster a player must be able to "hit" it. In order to hit a Monster, the player must play a card that matches both the color and the ring location that a Monster is in, as shown below. Several cards can be used to hit multiple Monsters or the same Monster. Monsters can NEVER be hit in the Forest ring. Only a few cards can hit monsters once they are in the Castle ring. Those cards have a symbol on them to indicate this. Each time a Monster is hit it takes 1 point of damage unless otherwise specified. Rotate a hit Monster clockwise so that the next lowest number is now pointing toward the Castle. Each type of Monster begins with a different number of damage points. Goblins have 1 point, Orcs have 2, and Trolls have 3 points. When a Monster loses their last point, they have been "Slayed". The player that hit the Monster for the last point of damage keeps that Monster token as a trophy. 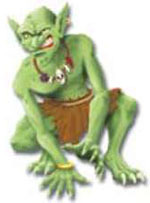 Monsters that are slayed by anything other than hits from players, such as attacking Walls or Giant Boulders, are not kept by any player. Instead those Monsters are put into the Monster discard pile. Some cards do not damage Monsters, but instead slow them down or even move them back into the Forest. For more information see the Play Details section. During the Play Cards phase of a turn, the player can also build Walls to replace any that have been destroyed by Monsters. To build a Wall, play both a Brick card and a Mortar card. A second Wall cannot be added to a Wall that already exists. All remaining Monsters on the board move 1 space. Monsters outside the Castle move 1 ring closer to the Castle. Monsters that are in the Castle ring move 1 space clockwise, staying in the Castle ring. Draw 2 tokens from the Monster pile and turn them face up one at a time. 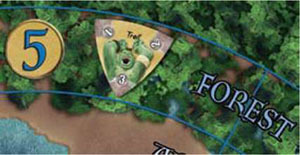 If the token is a Goblin, Orc, or Troll, roll the die and place the Monster in the Forest ring in the space that matches the number rolled. Place the token with the highest numbered corner pointing toward the Castle. More than one Monster may occupy the same space. The tokens drawn may also be Special Monster tokens: a Boss Monster or Monster Effect. Boss Monsters attack the Castle as usual and also have a special effect. 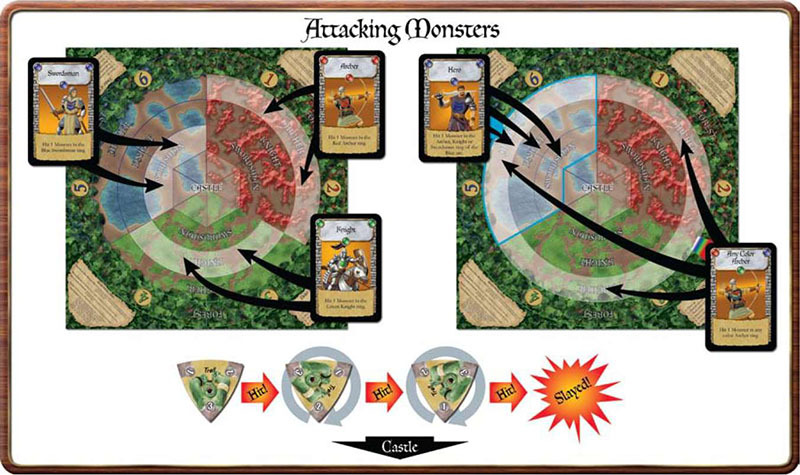 Monster Effects are not placed on the board but instead affect the players or Monsters and are then discarded. After the player has resolved the two Monster tokens, the turn is over. The player to the left now begins his or her turn. If the players have won the game, each player then adds up the number of victory points they have in trophies of slain Monsters. The player with the most victory points is declared the Master Slayer! In case of a victory point tie, the player that slayed the most Monsters wins. If there is still a tie, Fireside Games recommends players arrange for a duel of swords at dawn . ..
Work with other players to plan ahead. Trading a card with another player can be a great way to protect the Castle, even if it's another player's turn! Sometimes the biggest threat to the Castle isn't always clear. Pay close attention to the whole board. Some cards are more useful than others. Make sure to play them at the most advantageous time. The Monsters are worth different victory points. Carefully choose which Monsters to attack when. Remember, no one can be the Master Slayer if all the Towers are destroyed.